JavaFX Scene Builder b22 is available for Linux. Download it (along with versions for Mac and Windows) from the usual place. Hendrik Ebbers has two posts this week. Firstly a blog post about how to use native Aqua icons in JavaFX (when running on Mac OS X). Secondly Hendrik has blogged about assertions and rules in MarvinFX. MarvinFX is a testing framework for JavaFX is that Hendrik is currently developing. InteractiveMesh.org have released a 3D model importer for JavaFX 8.0 (using the new 3D capabilities that are included in JavaFX 8.0). At present it appears that source code is not available, but it would be great to see it. Speaking of 3D, as I mentioned last week, John Yoon from the JavaFX team at Oracle will be presenting at the Silicon Valley JavaFX Users Group on March 27. As per usual you can attend in person or virtually. What’s cool is that John studied animation at the UCLA Film School, where he received his Master of Fine Arts in Animation/Film. Prior to working at Oracle, John worked in the animation industry as a Character Technical Director at Disney Animation and DreamWorks Animation on such films as “Chicken Little”, “Meet the Robinsons”, “Shrek Forever After”, and “How to Train Your Dragon”. ScalaFX 1.0.0 M2 was released recently. If you’re interested in building JavaFX-based user interfaces in Scala, then you should definitely check out this library. Yennick Trevels has two posts this week as he continues his ‘JavaFX: Structuring your application’ series. Firstly, he posts about the application logic layer, and secondly about the service and application state layer. Russel Winder has put up a slide deck for his talk on ‘GroovyFX: or how to program JavaFX easily‘. Jorn Hameister has posted code that generates the Mandelbrot fractal using JavaFX Canvas. mihosoft have announced that they have ported the JFXtras Window Control (VFXWindows) to JavaFX 8.0. They say the main motivation was to gain retina support, but note that performance is also significantly improved in JavaFX 8.0.
tomo taka has blogged about creating a file system browser in JavaFX using the TreeView control. That’s all folks. Catch you all next week. JDK 8 b81 is out now for download, and as always contains the latest JavaFX 8.0 bits for you to test out. JavaFX Scene Builder 1.1 Developer Preview b22 is now available for download. 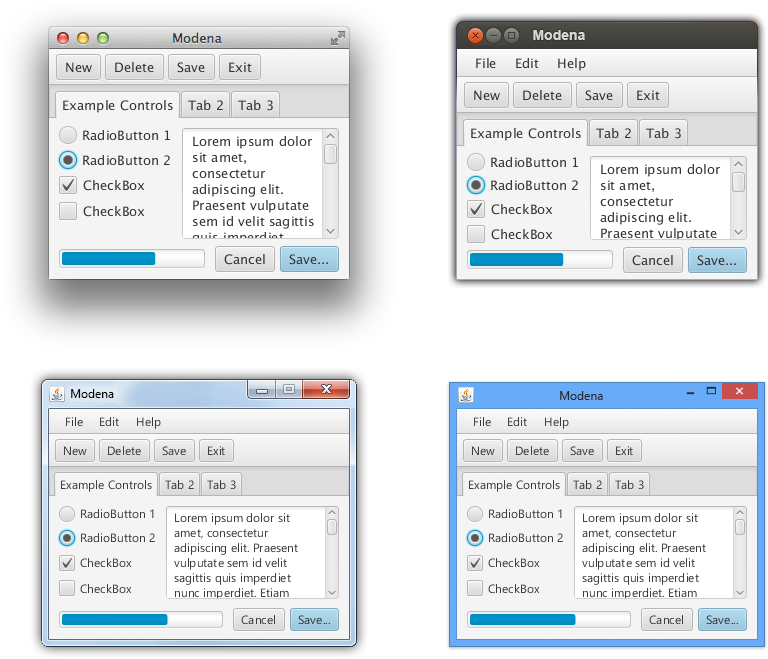 Jasper Potts posted an updated blog post about the new Modena theme that is coming to JavaFX 8.0. It has come a long way since the first post on Modena six weeks ago, and much of the community advice has been listened to to refine the Modena look. Personally I think it is miles ahead of what we shipped in JavaFX 1.x and 2.x (which is known as Caspian). Tom Schindl continues to write a number of interesting blog posts detailing his current projects. This week he has three posts. Firstly, he talks about building an intelligent code editor with JavaFX and JDT. Secondly he has announced the release of e(fx)clipse 0.8.1 which includes a number of new features. Finally, he has details of his upcoming talks about e(fx)clipse and JavaFX at EclipseCon next week. Speaking of Eclipse, Kai Tödter has blogged about his experiments with GEF4 graphics being rendered using JavaFX Canvas. Hendrik Ebbers has started work on a testing framework for JavaFX that he is calling MarvinFX. I hope that this project gains a lot of traction with the community and can grow to encompass fixtures for all UI controls to make testing quicker and easier. It’s not for another week yet (so I’ll remind you again in a weeks time), but John Yoon from the JavaFX team at Oracle will be presenting at the Silicon Valley JavaFX Users Group on March 27. As per usual you can attend in person or virtually. What’s cool is that John studied animation at the UCLA Film School, where he received his Master of Fine Arts in Animation/Film. Prior to working at Oracle, John worked in the animation industry as a Character Technical Director at Disney Animation and DreamWorks Animation on such films as “Chicken Little”, “Meet the Robinsons”, “Shrek Forever After”, and “How to Train Your Dragon”. It is great to see the JetBrains folks starting to get right behind JavaFX. This week they have posted about their improved support for JavaFX 2 CSS in IntelliJ IDEA 12.1. A whitepaper was published over at the Oracle Technical Network about how Integra CCS uses JavaFX to power contact centers around the world. Björn Müller has published an article titled Why, Where, and How JavaFX Makes Sense. Farrukh Obaid has published another JavaFX skin, this time it emulates the look of the Office Silver look. Jens Deters has a post about custom components, where is explores hover effects. Jorn Hameister has blogged about how to create a JavaFX dartboard with Shapes (Path, Arc, ArcTo, Circle) and Text. We have been working really hard on the new Modena theme for JavaFX 8. I think we are finally really close so I wanted to share with you where we got to. I really hope you like the progress and direction. We took a lot of the feedback from the last blog into consideration. Overall though I am really happy and feel that this is going to do as much as we can to make JavaFX applications look great out of the box. For those lucky enough to be running on Retina Mac then we also have support for Retina now in JavaFX 8 and with Modena so enjoy. The almost final version of Modena will be available this week in Java 8 Early Access build 81. For instructions for enabling Modena and running the test application see the first Modena blog post. The Canoo blog has published part seven of their abacus tutorial, this time focusing on integrating OpenDolphin. Michael Heinrichs has updated his inverse kinematics library to work with JavaFX 2.x. You can find the sources of the library including the code of the two samples on GitHub. Björn from CaptainCasa has posted another JavaFX client update detailing some of the updates to the CaptainCasa software. Tom Eugelink has posted a ListView extension class (also called ListView) to JFXtras which allows for two-way binding of the selected item property. Whilst I haven’t had a chance to test this myself I know that this is an often-requested feature from some users of the ListView control (and the same concept can be applied to the other selection model based controls such as TreeView, TableView, TreeTableView, etc). James Sheets has started up a new project to provide enhanced TableView functionality around filtering, or, as he puts it, “a set of drop-in replacements for JavaFX’s TableColumn class, which provides a visual editor for users to create filtering.” It would be great to see these ported to JavaFX 8.0 and using the built-in filtered list functionality. Yennick Trevels has posted on structuring JavaFX applications. Narayan Maharjan has posted about pagination and style in the JavaFX TableView. Richard Bair posted a YouTube video of how to build OpenJFX on a Mac with JDK 8 b78. This week I interviewed Felipe Heidrich in relation to his work on text in JavaFX (most notably rich text). This follows on from the interview I published the week prior with Tom Schindl covering his styled text editor work. OpenDolphin 0.7 has been released, with support for Maven, server events and much better performance. IntelliJ IDEA 12.1 has been released recently, and it includes a bunch more support for JavaFX. If this is your chosen IDE then I would highly recommend you upgrade! Speaking of IDEs, Nicolas Lorain has blogged about the improved support for JavaFX in the top IDEs (namely NetBeans, Eclipse and IntelliJ IDEA). Hendrik Ebbers has written about how to set a global stylesheet in your application so that you don’t need to set it per scene. Mark Heckler has blogged about how to pretty up your JavaFX TableViews (something obviously near and dear to my heart). Some good advice here that anyone working with TableView should read (especially the updates at the end related to performance tuning!). Gerrit Grunwald has ported his Swing version of the QlockTwo to JavaFX. Angela Caicedo has posted the second part in her series on how to manage multiple screens in JavaFX. Robert Ladstätter has ported his Conway’s Game of Life implementation to use the JavaFX 3D APIs that are coming up in JavaFX 8.0.
mihosoft has a blog up about making it possible to easily drag nodes in a JavaFX application. Rob Terpilowski has done another ‘extreme JavaFX gui makeover‘. Arnaud Nouard has released the 1.0 release of his Undecorator library for styling the stage ‘chrome’ of your application. Farrukh Obaid has posted more screenshots and a link to the source code for his MistSilver skin for JavaFX.